If you’re not yet acquainted with the many capability features that have been built into the new Ford EcoSport, the team at J. Wilderman Autoplex believes that you’re sure to be impressed when you take one out for a test drive. Below are just a few of the amenities that make driving this popular compact sport-utility vehicle model a pleasure. If you're looking for a truck that's built with a powerful engine, you may want to consider buying a Ford Super Duty. When you press the gas pedal, you'll quickly experience how this truck's engine produces consistent power on the road. Thanks to the Ford Super Duty's great torque capabilities, it can effectively tow cargo on a variety of terrains. This truck has earned its best-in-torque qualification because all of the power is generated from its V8 engine. You can operate this truck confidently at commercial sites as its built for industrial jobs. The popular Ford Edge is a compact SUV offering comfort and capability in an attractively designed package. For drivers wanting more, the Ford Edge ST adds an upgraded engine and eco-friendly options. The Edge ST's turbocharged 2.7-liter V6 engine delivers 335 horsepower and 380 pound-feet of torque and accelerates from a standstill to 60 mph in just over six seconds. An intelligent all-wheel drive system constantly analyses surface traction, delivering extra grip to wheels that need it most when encountering a sharp curve or loose gravel. The Jeep Renegade has what it takes to conquer obstacles. It's one of the popular models we offer at J. Wilderman Autoplex, and when you get behind the wheel of one, you'll see why. When you’re searching for a popular midsize SUV, the Dodge Durango should be at the top of your list. There are some incredible trim levels for you to choose from, providing you with the rugged luxurious nest that you demand. Quite a few appearance packages are available. This includes the Brass Monkey package as well as the Anodized Platinum package. Each offers quite a few bold aesthetics for the exterior of the SUV. It will allow you to separate yourself from other vehicles on the road. Ford Explorer customers know that they can expect power and performance in the popular three-row SUV. Now, they also know that they can expect the most advanced technological features for their safety and convenience. Let’s see what Ford customers are talking about. The new Ford Explorer is equipped with one of the most advanced technology systems on the market. It starts with safety systems such as adaptive cruise control and a state-of-the-art forward collision warning system. Few sports cars in the world can contend with the new Ford Mustang, which combines classic performance with modern styling. This muscle car is available in several all-new editions, such as the BULLITT and GT Fastback. You can test drive a convertible or coupe at J. Wilderman Autoplex. A rear-wheel drive (RWD) system is standard on this athletic American car. This high-performance drivetrain is paired with several class-leading mechanical features. For example, the Launch Control significantly improves acceleration on asphalt and other paved surfaces. We here at J. Wilderman Autoplex understand the importance of finding a new vehicle with the right set of features and design to match your style. Growing in popularity, compact crossovers like the 2018 EcoSport continue to become popular choices. When cold weather hits, the available cold weather packages can help the Ford EcoSport be prepared for snow and ice. The de-icer built into the windshield wipers keep the resting area heated to prevent snow and ice from building up on the blades. For drivers who have a large family or just a lot of cargo to bring with them, a new SUV might just be the perfect option. Of course, when you are searching for an SUV that is capable of handling everything that life throws at you, look no further than the Ford Edge. One of the reasons that you buy a muscle car is for the performance it brings you on the road. 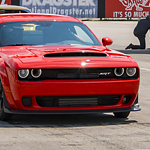 The Dodge Challenger does more than just look good. The power under the hood of this classic sports car is everything you have ever dreamt of. Here's why.